Hawks are known to be a nuisance to farmers. They are fond of smaller warm-blooded animals for nourishment. Hawks will feed on free-range chickens, ducks, turkeys and geese when the opportunity arises. When other methods have failed, trapping and moving a hawk away from the area is a successful way to protect smaller farm animals without harming the predatory bird in the process. Determine that the farm animals lost are due to raptors, or predatory birds like hawks. Sightings of hawks in the area, and no more than one kill a day are signs of a predatory bird like a hawk. Puncture wounds from the hawk's beak and talons will be visible on the carcass. Try other options to protect farm animals before attempting to trap or kill a hawk. Bringing the animals inside at night is one way to protect them from hawk attacks. Try to scare the hawk away from the area using a scarecrow that is moved frequently, and pyrotechnics that create loud noises and are approved by your fire warden. Also increase human presence in the area. Obtain a permit to trap a hawk from the U.S. Fish and Wildlife Service. Also check with the local wildlife agency to see if a permit is necessary on the local level. 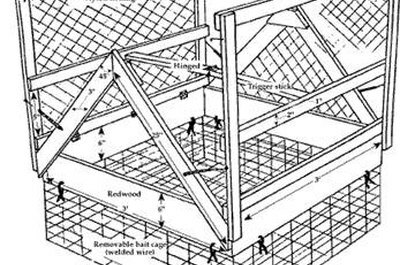 Purchase a Swedish goshawk trap or a bal-chatri trap. These are both humane traps that will not kill the hawk. They both use live mice as bait for the hawk. Purchase live mice for the trap. Set the trap in an area where the hawk is seen frequently, and check the trap at least twice a day. To transport the bird once it's been trapped, cover the trap with a blanket. Be very careful of the hawk's talons, as they can be dangerous, and ask a wildlife manager for assistance if needed. If the bird appears injured or sick, bring it to a raptor rehabilitation center before releasing.